Each holiday season, marketers can look forward to a few months of predictable shopping behavior and navigation trends. This year, right on cue, shoppers made their way to supermarkets in the run-up to Thanksgiving Day and flooded retail storefronts on Black Friday. And, as we enter the first week of January, we expect consumers to start hitting the gym in pursuit of their dreams of improved health and rock-hard abs in 2017. As we wrap up the holiday season, we take a look at the navigation habits of these fitness-focused "resolutionaries" and share some insights to help you capitalize on consumers' unusually high motivation. Last Cheat Meal of the Season? The road to fitness isn't without its speed bumps, and if history is anything to go by, we can expect a good number of consumers to take an early detour. Waze data for the first days of 2016 shows a spike in navigations to fast food restaurants that suggests consumers rang in the new year by enjoying their last cheat meal of the season. 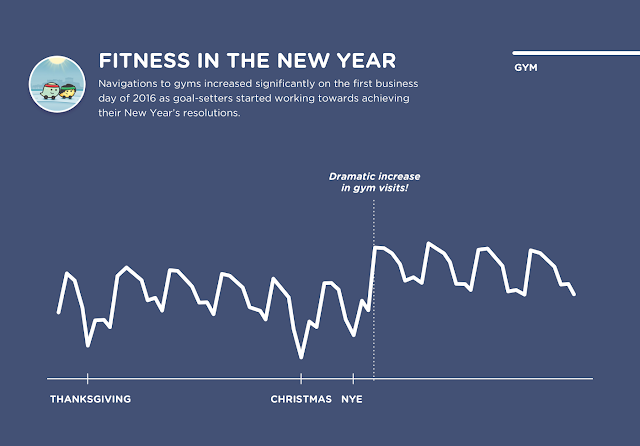 Our data also shows that users spent the weekend recovering from their New Year's festivities and avoiding the gym altogether, presumably storing up the energy to jump start their fitness goals on Monday. This end-of-season indulgence is a golden opportunity for QSR and CPG brands to appeal to consumers and potentially play a part in this last hurrah ritual. On the first business day of 2016, our data shows a steep increase in navigations to gyms. 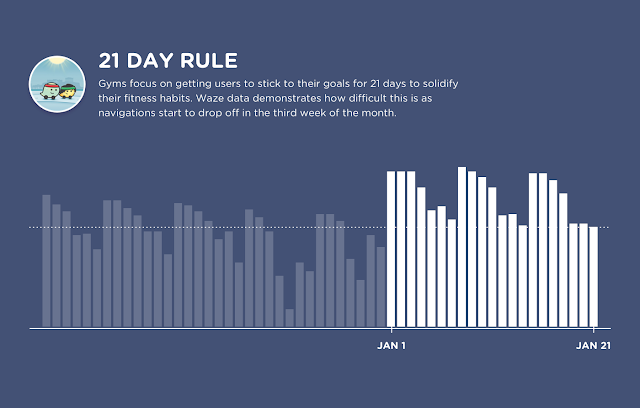 This volume persists for a few weeks, as fully committed users tried to settle into a new routine. This is the perfect time for advertisers to reach Wazers navigating to and from the gym and offer them relevant deals. Food marketers can provide discounts on low-carb meals and salads. Gyms could use ads on Waze to manage the traditional early morning and early evening spikes in foot traffic by encouraging users to take a midmorning spin class or an early afternoon yoga class. 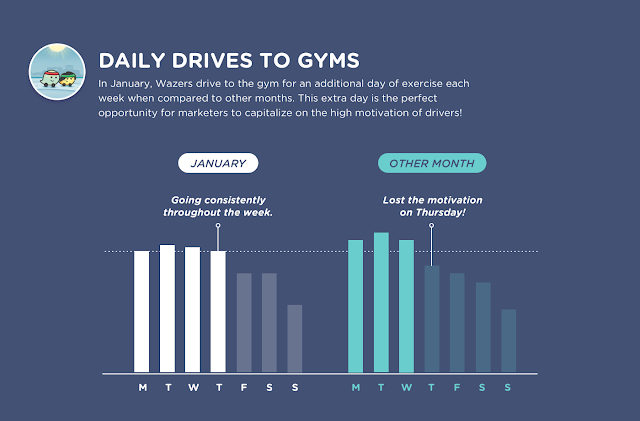 According to Waze data, navigations to the gym during any given week peak Monday through Wednesday and start dwindling on Thursday. In January, motivation is at an all-time high, and navigations spike for an additional day per week as workday warriors trade in their Thursday happy hours for HIIT sessions. With consumers still focused on fitness through Thursdays, marketers have an extra opportunity to capitalize on motivated consumers who may be eager to treat themselves to a well-earned reward. For example, an ad promoting a special Friday night dinner or the latest fitness tracking gadget could be particularly powerful if delivered to a consumer on her way home from the gym. Given the commonly held theory that it takes 21 days to establish a new habit, the spike in gym traffic on Thursdays is also great news for gym owners who want members to solidify their long-term fitness habits. In fact, members who visit the gym at least three times a week in the first month of membership refresh their memberships 78 percent of the time, according to PT Direct (compared to 59 percent for members who only visit the gym once per week in the first month). 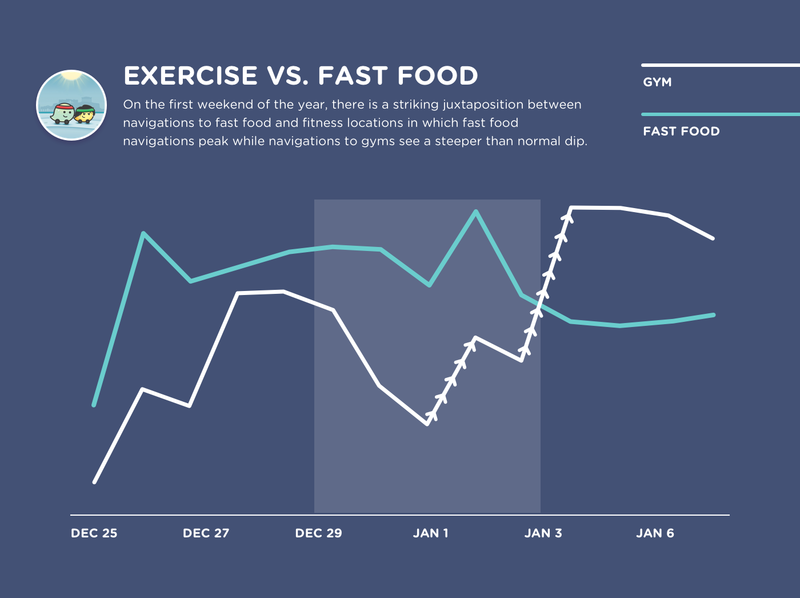 As Athletic Business notes, many clubs will start reaching out to members if they have not stopped by during the first 21 days of their first month, and Waze navigation data corroborates the challenge of keeping members engaged through this milestone: the first dip in navigations to gyms in January 2016 occurred at the three-week mark. Luckily, Waze offers several advertising opportunities that allow gym owners to reach users who have navigated to their gyms or interacted with previous offers so they can provide extra motivation when would-be gym-goers are most likely to waver. This new year, we expect consumers to enjoy one last fast food meal before fully committing to their health goals and getting to the gym more often. Waze encourages marketers across all industries to leverage our navigation insights and engage consumers in a meaningful way while fitness is top of mind. QSR marketers can focus on their low-calorie items, retailers can highlight their fitness offerings, and gyms can acquire and retain members by promoting special deals to those highly motivated consumers on the road to fitness in 2017.